The article isn’t short, so here are convenient links for hopping to the section you’re looking for. Angular, supported by Google, is an open-source software engineering platform used for building user interfaces (front-end). It’s history traces back to 2009 when Misko Hevery and Adam Abrons, Google engineers, developed the framework currently known as AngularJS and officially released it in 2010. AngularJS. In 2010, AngularJS’s main benefit was that it let you turn HTML-based documents into dynamic content. Before AngularJS, HTML, the web markup language, was always static, meaning that users couldn’t actively interact with interfaces on the HTML pages. There were some ways to build dynamic, single-page applications (SPAs) but they were too complex for convenient engineering. AngularJS architecture reduced development effort aimed at creating dynamic content and the users got web pages with dynamic forms and elements. Angular 2+. In September 2016, Google released Angular 2. They rewrote the framework entirely, matching the growing requirements of the modern web. And the difference between AngularJS 1.x and the new Angular was so radical that you couldn’t just update from one to the other. Adoption of the new technology required rewriting your applications completely. In 2017, another major update, Angular 4, arrived. It made several significant improvements to version 2 but remained the same product at its core. Since that time Google has been regularly releasing updates. The current version, Angular 6 was rolled out in May 2018 and version 7’s debut is planned for October 2018. To avoid terminology confusion, we will simply be calling the new framework Angular, as some community members suggest, as opposed to the old AngularJS 1.x version. Angular belongs to the so-called MEAN stack. The acronym describes four technologies that cover major software product development aspects. While engineers may be using Angular regardless of other technologies in the stack, they can always rely on an existing firm ecosystem that also has its full-stack developers, specialists covering all aspects of software development. Here we’ll talk about the main tools that engineers commonly use with Angular to get the full benefit of the framework. RxJS. It’s not likely that you’ll be able to work with Angular without RxJS, a reactive programming library, aimed at handling asynchronous data with multiple events. It basically allows engineers to set up multiple channels of data exchange to ease resource consumption. Angular CLI. Command line interface (CLI) is used to create projects, add files, perform updates, deal with debugging testing, and deployment. We’ll talk more about RxJS and Angular CLI below. Code editors. Currently, many popular code editing products support Angular. The most common ones accepted by the community include Visual Studio Code, Sublime text, and surprisingly not – Angular IDE, and WebStorm. However, check to determine if your favorite code editor fits Angular. Let’s briefly recap the main benefits that made original AngularJS shine among other front-end development frameworks as well as describe the main drawbacks of the tool. ⊕ Two-way data binding. AngularJS was built with Model-View-Controller architecture. And the framework synchronized the Model and the View. As the data in the Model changes, the View does too. Two-way data binding allowed engineers to reduce development time as it didn’t require writing additional code to provide continual View and Model synchronization. ⊕ Directives. This feature actually enabled the HTML extension mentioned above. Directives allowed developers to assign special behaviors to the Document Object Model (DOM), permitting engineers to create dynamic and rich content with HTML. ⊕ Dependency injection. Dependencies define how different pieces of code interact with each other and how the changes in one component impact the other ones. Usually, dependencies are directly defined in components themselves. So that every change in dependency requires changing components as well. With AngularJS, you could use injectors that defined dependencies as external elements decoupling components from their dependencies. Dependency injection made components more reusable, easier to manage and test. ⊕ Community. Right from the beginning, AngularJS became extremely popular among engineers. A strong community provided enough training materials, discussions, and third-party tools to embark on using AngularJS as well as find a solution to nearly every arising issue. Θ Performance. Dynamic applications didn’t always perform that well. Complex SPAs could be laggy and inconvenient to use due to their size. Θ Steep learning curve. As AngularJS is a versatile instrument, there is always more than one way to complete any task. This has produced some confusion among engineers. However, the abundance of tutorials and issue discussions allowed for resolving most of the problems. After the release of Angular 2 and then the Angular 4 update, the use of the original AngularJS 1.x slowly started to decline. While the new versions still have the same features, described in the benefits section, they were completely rebuilt in the new versions. Let’s have a look at the main benefits that the technology suggests to the engineering community, including the component-based architecture, mobile-oriented philosophy, performance, and some other characteristics that make Angular stand out. Components can be thought of as small pieces of an interface that are independent of each other. Imagine that you have a simple application with a list of items and a corresponding search box to retrieve the items by word matches. The box with listed names, the search box, and the main sheet where the other two boxes are placed are all considered separate components in Angular. While AngularJS was built mainly around the Model-View-Controller (MVC) architecture, starting from version 2 Angular is considered component-based, which is very similar to MVC but ensures higher reusability of components across the app. This allows for building UIs with many moving parts and, at the same time, streamlines the development course for engineers. What are the main benefits of such architecture? Reusability. Components of a similar nature are well encapsulated, in other words, self-sufficient. 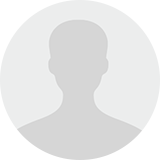 Developers can reuse them across different parts of an application. This is particularly useful in enterprise-scope applications where different systems converge but may have many similar elements like search boxes, date pickers, sorting lists, etc. Readability. Encapsulation also ensures that new developers – who’ve been recently onboarded to a project – can read code better and eventually reach their plateau of productivity faster. Unit-test friendly. The independent nature of components simplifies unit tests, quality assurance procedures aimed at verifying the performance of the smallest parts of the application, units. Maintainability. Components that are easily decoupled from each other can be easily replaced with better implementations. Basically, your engineering team will be more efficient in maintaining and updating the code within the iterative development workflow. Currently, TypeScript is considered the base language for Angular and the documentation is also created for TypeScript. While many engineers complain about the RxJS learning curve – and it’s quite a steep one – as soon as you master the tool, it shines in multiple ways. The library operates with Observables, sort of blueprints that describe how data streams are combined and how the application reacts to variables in these streams. Basically, once you’ve got a grip on observables, you can easily reuse them, manage, and combine them as Lego blocks reducing the complexity of such programming operations as building drag-and-drop features, handling large volumes of data in chunks, etc. You can leverage RxJS with other frameworks that function with front-end (React.JS) or back-end operations (Node.JS), but in Angular RxJS is a necessity, which we’ll also discuss in the cons section. 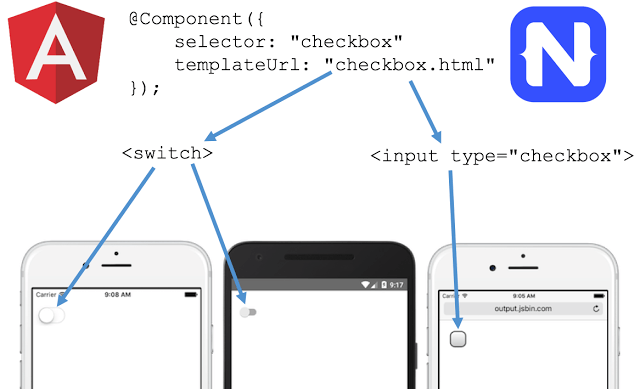 Angular was developed with the mobile-first approach in mind. The idea is to share code base and ultimately the engineering skillset across web, iOS, and Android applications. To make this ambitious positioning happen, in 2015 Angular developers cooperated with the team behind the NativeScript framework (which focuses on building close to native mobile apps). Not only the code itself, but Angular concepts such as dependency injection, data binding, services, and routing are similar both for NativeScript and Angular. Multiple factors can help in making your application faster. The main boost is ensured by hierarchical dependency injection and Angular Universal support. Hierarchical dependency injection. Angular uses improved hierarchical dependency injection compared to AngularJS. The technique decouples actual components from their dependencies by running them parallel to each other. Angular builds a separate tree of dependency injectors that can be altered without reconfiguring the components. So, classes don’t have dependencies in themselves but consume them from the external source. The approach provides high-performance scores for Angular applications. As the Angular team claims, Angular 2 was 5 times as fast as Angular 1.x, and – as engineers claim – the later versions have even increased the performance mark. Angular Universal. Angular Universal is a service that allows for rendering applications view on a server instead of client browsers. Google provides a set of tools to either pre-render your application or re-render it for each request by a user. Currently, the toolset is tailored to Node.JS server-side frameworks and supports ASP.NET Core. Google claims that they are going to add support for PHP, Python, and Java. But we recommend taking any performance claims with a grain of salt. Not only does the underlying architecture contribute to that, but also the quality of code that your engineers produce. Some software engineers consider the mere fact that Angular is supported by Google a major advantage of the technology. While this may sound justified, Google itself is not enough. The good sign though is that Google announced Long-Term Support (LTS) for the technology. Igor Minar and Steven Fuin, the engineers behind Angular, confirmed this commitment in the ng-conf 2017 Keynote. What this basically means is that Google plans to stick with the Angular ecosystem and further develop it, trying to hold the lead positions among front-end engineering tools. If you’re into the Google ecosystem or you just think that Material Design is a cool set of design guidelines, you’ll be happy to know that the Angular team has been updating their framework with material design components. The great thing about material design is that it’s a consistent and deeply justified system that considers how people interact with digital products and strives to make their experience seamless and aesthetically pleasing. If you’ve been using Google Drive, Google Cloud, or Android, most likely you’re familiar with it. With Angular Material you get pre-built components the variety of which span across form controls, navigation elements, layouts, buttons and indicators, popups, modal windows, and data tables. They are adjusted to Angular use and are easy to integrate into a project. Angular command line interface is favored by many engineers for various reasons. It’s easy to set up, newcomer-friendly, comes with testing tooling out-of-the-box, simple commands, and more. One of the impressive features of the recent version 6 is the ng update <package> command. It checks the package and makes recommendations for updates possibly required for all dependencies, including loaders and plugins. Some code updates that involve 3rd-party dependencies can be updated automatically by the… 3rd party if – for instance – they decided to fix something in their products. You may check how this works on the Angular Update Guide page. The same applies to Angular itself. Considering that the team has an impressive rhythm with new versions coming in about six month, there must be a simple way to update Angular itself without breaking anything. Ng update @angular/core will refresh your framework packages, TypeScript, and RxJS. As Angular has been around for quite a long time, it’s been snowed under by packages, plugins, add-ons, and development tools. You can explore a part of the community handiwork by looking at the list of Angular Resources. These include IDEs, tooling, UI environments, Angular Universal for server-side rendering that we mentioned above, analytics tools, facilities for ASP.NET, data libraries, etc. If the average engineer gets lost, there’s always a tool to help solve a problem that pops up. If you have multiple projects running some of which aren’t Angular, with the 6th update you can use Angular Elements in other engineering environments. These may be the apps built with VueJS, React, or even jQuery. You can reuse your Angular component by wrapping it as a DOM element (Custom Element). It’s really convenient if you or your team have to switch between various environments. If you’ve been following the hype and discussion around Angular 2-6 releases, you may know that the technology generates much criticism around it. Let’s examine the main drawbacks to also be considered. Regardless of the LTS claims, the community around any technology is what makes it powerful in the market. And the Angular community story is quite controversial. 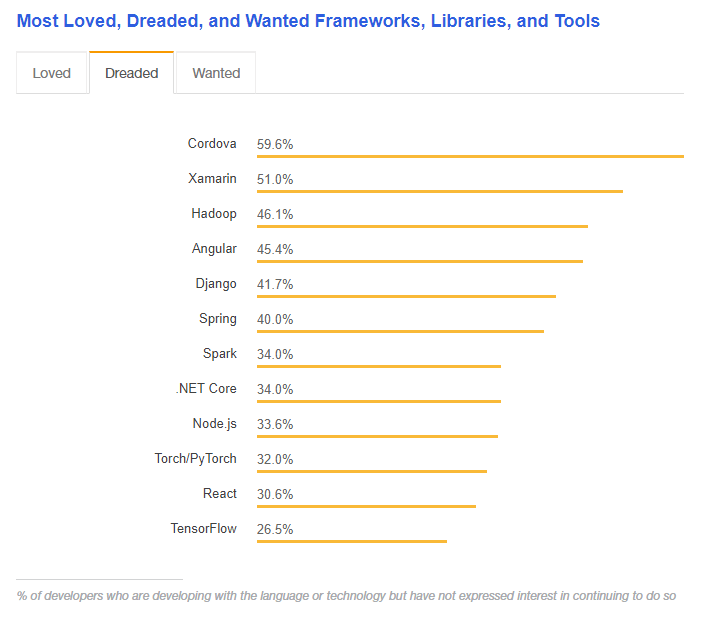 According to the 2018 StackOverflow Developer Survey, Angular (both Angular 1.x and Angular) is the second most commonly used technology in the category Frameworks, Libraries, and Other Technologies, which is cool. But the reality is that the developers that commonly use Angular are likely to churn according to the same survey in the category the Most Loved, Dreaded, and Wanted Frameworks, Libraries and Tools. Currently, TensorFlow is the most loved technology polling 73.5 percent, followed by React with 69.7 percent. And 45.4 percent of the respondents are considering Angular the most dreaded technology. It’s lower than Hadoop (46.1), Xamarin (51), and Cordova (59.6), but still quite high. On the bright side, the result is lower than in the previous year (48.3), and likely the people who are stuck with AngularJS on legacy products also voted. So, some part of this negative reaction may actually be addressed to AngularJS. This is mostly since AngularJS 1.x users are likely to churn and don’t consider transitioning to modern Angular. As you remember, you can’t directly update from the AngularJS 1.x. As we said, the difference between AngularJS and Angular is large, so is the path of migration from the past to the future. Check this migration recommendations page. Unlike updating from say Angular 5 to Angular 6, it won’t be a breeze, especially if you’re dealing with a legacy monstrosity. There are different ways to do that, one of which is to use a hybrid approach. It entails having both old and new Angular operating at the same time while you incrementally update the whole product. Not only does it take time, you’ll have to review many tools, the transition to a new language, and deal with a heavier app as you have both Angulars running. The most frequent complaint that you hear from the Angular development community is the verbosity of the instrument. This problem hasn’t changed since AngularJS. 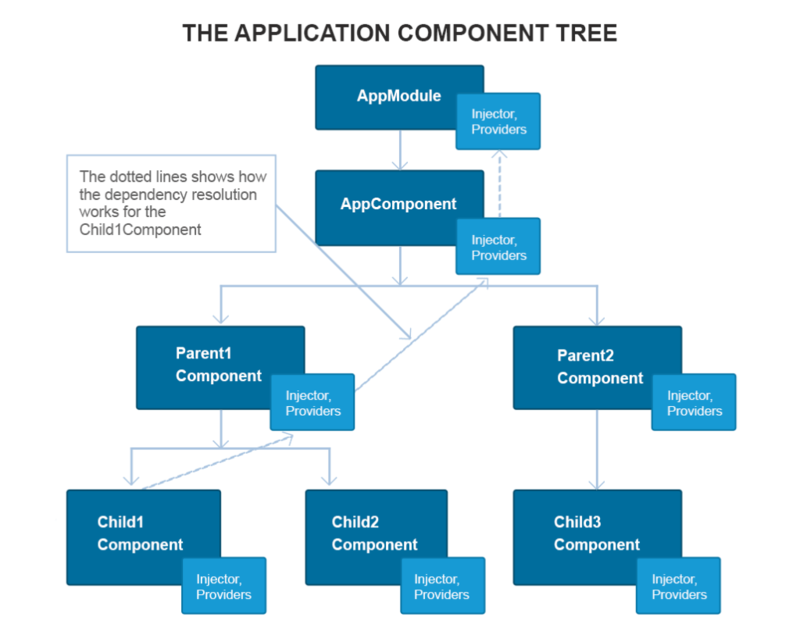 Although we’ve mentioned the component-based architecture as the major Angular benefit, the way components are managed is too complicated. For instance, you may need up to five files for a single component in Angular, have to inject dependencies, and declare the component lifecycle interfaces. Other points of concern are Angular-specific 3rd party libraries and its syntax. Consequently, much of the development time in Angular is spent doing repetitive things. Another barrier is RxJS, a reactive programming library for asynchronous programming. Learning it, at least on the basic level, is mandatory for using Angular. Engineers complain about error messages that are too cryptic to grasp without additional research followed by trial-and-error manipulations. TypeScript, as we’ve already mentioned in the benefits section, is also a bone of contention. While TypeScript improves maintainability of code, having to learn it doesn’t make the curve gentler. Some engineers express concerns with the current state of CLI documentation. While the command line is very useful and loved by Angular developers, you aren’t going to find enough info in their official documentation on GitHub and you’ll spend some time exploring threads on GitHub to get answers. Luckily, the community is there to help. Claiming that new Angular is controversial would be too euphemistic. If you were to read different feedback posts from the development community, it’s likely that you’d stumble over complaints rather than excitement. But we aren’t that pessimistic about Angular. The use of TypeScript for increasing the maintainability of code, the performance score that improves as you make more complex applications, and a specific ecosystem choices hint that Angular is likely to become the main instrument for long-term and heavy-investment projects where a steep learning curve is compensated for by stability and ongoing tech support. And this is the major difference between the new Angular and ReactJS that you may also consider. The latter is easy to grasp, deploy, and start working with, but it’s definitely less versatile and maintainable than Angular. Simon, we share a similar opinion. Bringing these tools to а common denominator is not completely right which we addressed in our new article comparing React vs Angular. Would love to hear what you think about that one as well. Enterprise scale apps with angular? Good luck. I guess it depends on your definition of enterprise scale. Usually what angular blogger-developers consider enterprise scale is just trivial stuff. Maybe it’s the effort needed to build trivial stuff that is enterprise scale when using angular. Every application has some limitations and pros. It depends on you what is your requirements. In today’s world, there are a lot of companies offering angularjs development services and they also promise to be the best and will easily convince you to use angular for your application. But it is very time-consuming when comes to SEO of angularjs based website or applications. Thanks for your comment, Bhim. With our articles, we aim to help businesses better understand different technology to be able to make these decisions independently.